Coming from a relatively warm climate in New Zealand, it was difficult adjusting to the 4 seasons in 1 day type of weather in England. The temperature swings like a pendulum, going from one extreme to the next. The temperature hovers around 8 degree Celcius (45 F) in the morning when you walk out the door and climbs steadily to a high 22 Celcius (70 F) before plunging into the abyss by nightfall. No sane person would ever walk out of the house without an additional layer which could be removed or put on when required. I've been looking for a casual spring jacket for the past 3 months. 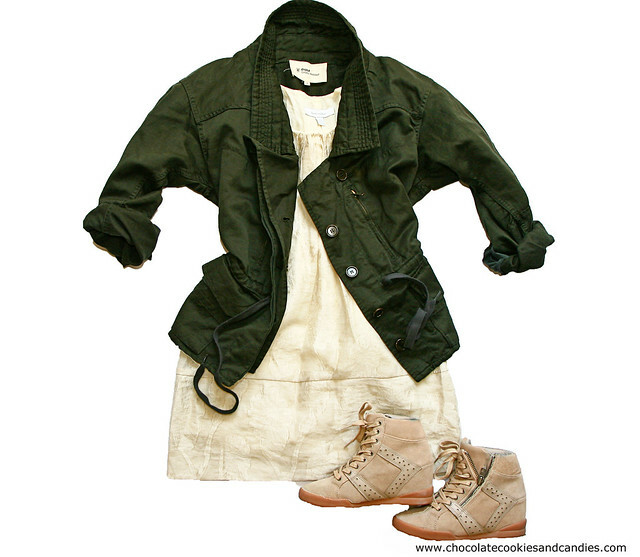 I found this military green gem by Etoile Isabel Marant, thanks to Heather of Flying Fish in a Big Pond. She took us out shopping when we met up in Istanbul last month. 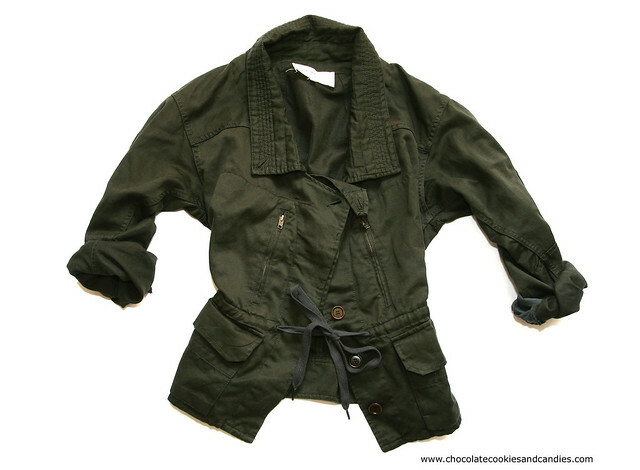 She managed to fish this Isabel Marant military green jacket from an ocean of clothes at the large department store. I was overwhelmed by the sheer number of racks and had no idea where to start looking. If it wasn't for Heather's enthusiasm and bubbly personality, I would've gladly sat down somewhere and fought with Lil L for the iPad. It has proven to be not only versatile but flattering thanks to the construction. You've probably seen the Karen Walker dress on numerous occasions over the past 2 years. A quick mental calculation revealed that cost per wear must be in cents by now. The practicality of having plenty of deep pockets to store my junk won me over too. Thankfully, the temperature is finally hitting the early 20s Celsius (70 fahrenheit) so it's time to say goodbye to my thick woolies. Hahahaha - I'm sure you could guess my reaction after reading this post? It was: "OMG!!!! I need a jacket exactly like that!!!!!!" and that dress is just so pretty! I love how you put this outfit together, it looks so cute. A military jacket is something i dont own and not sure how to style. Having four seasons in one day sounds very extreme, i guess i should not complain about the weather where i live . It is freaking hot but much more predictable than England. I really need a jacket like this - just perfect! Marant does it again! Yep love this look! I finally found a parka and hopefully a light casual jacket like this too along the way. Very versatile jacket, and it will be the perfect layer for those days! The weather have been acting crazy lately! Absolutely TDF!! I get envious sometimes with those you get to use jacket almost all year round. Here, forget it! Great outfit! Does anyone know the name of this jacket?? I love the outfit. What a find with that jacket! That's definitely a keeper. Wishing some warm(ish) weather for you to be able to get some good wear out of it. That's a beautiful jacket, and it'll go such a long way! Ahhh love the jacket M! Heather sounds like the perfect shopping partner! Love how you paired it with the wedge trainers! I love Isabel Marant jackets, they are out of my price range but this one is beautiful. I love my own military style jacket and think it`s really useful and versatile. Easy to dress up an down. Jackets in general are a staple in my closet! That sounds like the weather in Louisiana. Except one day it will be 36 degrees and the next it will be 70 degrees. It is nuts! I love that jacket! What's a fabulously versatile find! I always need the extra motivation (read: someone forcing me) to find something good amidst racks of clothes... I just don't have the patience for it. I love the combination of that dress, those sneakers and the jacket.... Before you know it your per wear cost will be almost free! That's a lovely combination of colours. The green on the jacket is gorgeous. I've been on the lookout for a really nice parka and all the really nice ones are Isabel Marant ones and out of my price range! Lovely jacket. I saw those trainers in Kooples the other day and thought of you, they're really cool. Ooh I love this!! Such a great find! I tend to get overwhelmed in department stores too so how nice you had a friend there to guide you through.